New Music Beauty Queen is an innovative musical response to an innovative fashion label. In curating the programme, The Sound Collectors Louise Devenish and Leah Scholes were inspired by the 2014 collection of the clothing store, manufacturing company and fashion label New Model Beauty Queen. NMBQ is an ethical and sustainable clothing company stocking products made from recycled fabrics. Rather than contribute to each season’s excess of new fabrics, the labels stocked at NMBQ source fabrics from auction houses and redesign them with the aid of NMBQ’s Ethical Clothing Australia-accredited screen printing facility. With their batteries of percussion instruments spaced around the bright, white basement under a sky of incandescent bulbs, The Sound Collectors achieved a thought-provoking synthesis of materials collected from text, gesture, news and politics. NMBQ’s 2014 collection was inspired by Matilda Butters’ Press Dress from 1866. Butters was a costume designer and, as wife to the politician James Stewart Butters, a serial fancy dresser. The silk Press Dress was printed with the front pages of fourteen different Victorian papers and the mastheads of eighteen regional papers. NMBQ’s 2014 collection, which was spread around the edges of the basement, features vintage typefaces and images printed over bold, block colours. The original Press Dress was even on display by the door, looking perfectly at home alongside NMBQ’s more recent creations. 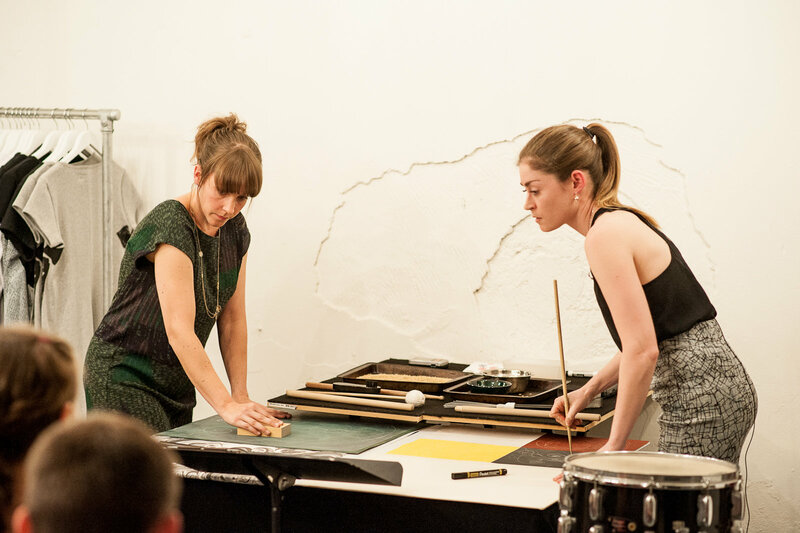 Leah Scholes and Louise Devenish complemented the collections with a programme of new and existing percussion repertoire inspired by current affairs, politics, text and gesture. Beyond the thematic similarity between the NMBQ collection and the Sound Collectors’ programme, there is a two-dimensionality to the works by Burkhardt, de Mey, Davidson, Hope, Leak and Applebaum that match the designs by NMBQ. Each piece is a linear sequence of actions, words and percussion events pressed upon silence like the symbols printed on the t-shirts and dresses around the edges of the NMBQ basement. Simulcast by Rick Burkhardt begins with the two percussionists as news readers or radio announcers, speaking into cow bells to give their voices a distant, muffled tone. The text appears to begin with a stream of consciousness of a sales person or a journalist on a trip, walking unfamiliar streets and taking photographs. Before long the tone turns sinister. There is confusion, the speaker is trying to ask questions and is frustrated with the questions of others. Are they at a press conference? An interrogation? The piece leaves the audience as confused at the end as they were at the start, but set up the text-based and focussed dynamic for the rest of the concert. Thierry de Mey’s Silence Must Be is a simple and extremely effective exploration of audience expectations in the relationship of sound and gesture. Scholes conducts in silence at one end of the basement. The conducting becomes more stylised, like a sort of martial art (conductors would probably like to think that they are ninjas). The gestures change from open-handed strikes to smooth, swaying lines and figures of eight. Two figures of eight move in and out of phase like sine waves. Suddenly Scholes starts from the beginning, but this time each gesture is accompanied by a sound from Devenish’s battery at the opposite end of the room. Of course that is what the gestures sound like! Just as one is becoming overwhelmed at the cleverness of it all, the percussion stops. The rest of the gestures play out in silence. The lack of sound compels one to imagine what Scholes’ gestures would sound like. Would they be high or low? Rough or smooth? How would they move? Rob Davidson’s highly politicised music recently went viral with his choral setting of Julia Gillard’s misogyny speech. Davidson has continued in the same vein with Human Beings as Well, a piece for two percussionists and a recording of a Sky News reporter interviewing an Islamic commentator. After the interviewer asks the commentator whether he condones beheadings by extremist groups such as ISIS, he responds that Islamic people are “human beings too” and “shouldn’t have to justify” themselves against the actions of extremists. “Get over yourself” the interviewer interjects. The percussion parts bolt along beneath the tragicomic interview. Davidson mocks the sensationalism of the Sky News interview with an upbeat groove, while amplifying the intensity of the speakers’ voices by echoing them on skin drums. In Hope’s Sub Aerial, the performers trace particular patterns with percussion brushes and mallets on pieces of fabric with different textures. Finally, they trace shapes in the air with portable radios tuned to static. The piece is extremely quiet and was unfortunately drowned out by the overhead fans of the basement. Nevertheless, I was put in mind of a conversation I recently had with the composer Cat Hope at a conference. I, defending pitch-class set theory in the analysis of certain notated post-tonal works, made the generalisation that after one discards the rules of harmony, modality and counterpoint as guiding principles of a work “all one is left with is numbers.” I meant by this that one is left with raw, uninterpreted data. The music analyst’s job is then to find some order in the data, either the composer’s or one’s own. Hope rightfully took me to task for this generalisation, as a set of pitch-classes will not necessarily lead one to understand compositional processes or modes of listening based on curves and gestures rather than discrete pitches and durations. We were of course talking at cross purposes. I was talking about the analysis of dodecaphonic, serial and alternative serial works while Hope was talking about post-serial works and graphic scores. I think Hope would also agree that works like Sub Aerial are no less precise and repeatable than a piece that can be reduced to pitch classes. The use of graphic scores is not always about introducing greater uncertainty and scope for interpretation into a work, but is a way of creating scores that demand the same fidelity from the performer as any notated score. Next to more recent text-based works, Graeme Leak’s … And Now for the News from 1984 still sounds fresh. As Devenish pointed out, the piece was one of the first Australian solo percussion pieces composed by a percussionist-composer. Like Davidson’s piece, the work incorporates a tape part, this time a Vietnamese news bulletin recorded from 2EA radio. The piece combines direct imitation of the rhythms of the spoken language with metrical episodes derived from the transcription. Thanks to Devenish and Scholes’ sensitivity and precision as performers, the concert was a revelation as to the merits of text and gesture-based works. As the rhythms of … And Now for the News and the gestural curves of Sub Aerial show, there are rhythms and phrases in actions and words that a musician won’t come up with when composing at an instrument or hunched over a piece of manuscript paper. But against the backdrop of these incredibly successful attempts at mining speech and gesture, Mark Applebaum’s Gone, Dog. Gone! appears less convincing. As Scholes explained to the audience, Applebaum is interested in the musical value of gestures abstracted from their contexts and meanings. Gone, Dog. Gone!, like its predecessor Go, Dog. Go!, is inspired by a children’s book. A part of Gone, Dog. Gone! mimes every bizarre action that a group of dogs are performing in a tree during one part of the book. In Applebaum’s piece, one percussionist performs a sequence of gestures while the other plays corresponding punctuations on a table of percussion instruments. Particular gestures do not seem to be accompanied by particular sounds and the sounds themselves are so short (the battery consisting of small glass and metal objects) that their relationship to the gestures beyond signalling their overarching rhythm is obscure. From what, then, is the overarching rhythm of the piece derived? The rhythm, however chosen, seems to drive the gestures rather than the other way around. The piece was nevertheless a joy to watch as the catalogue of gestures are not too literal, leaving one guessing what they could be referring to. Applebaum’s piece was just one part of New Music Beauty Queen as a thought-provoking and thoroughly enjoyable synthesis of repertoire and context. Programme: Rick Burkhardt, Simulcast; Thierry de Mey, Silence Must Be; Rob Davidson, Human Beings As Well; Cat Hope, Sub Aerial; Graeme Leak, … And Now for the News; Mark Applebaum, Gone, Dog. Gone!